I always find it difficult to review the third book in a trilogy. The review inevitably turns into a review of the series instead. Well, The Hod King is even tougher in many ways because it’s not the end. The series is a quadrilogy. As such, I’ve been sitting on the review for a few days, trying to figure out what I’m going to say about it. Here goes. The Hod King picks up where The Arm of the Sphinx left off. Senlin is closer to his wife than ever, knowing now where she is and who she is with, and the story starts with him in the same ringdom. But he isn’t there to see his wife, he’s on a mission from the Sphinx. It’s a book of 3 parts, but takes place over the course of about a week. Part 1 is Senlin’s tale, then part 2 is Voleta and Iren’s part in events, and part 3 is Edith’s (and Byron’s) salvo. It’s an interesting way of telling the story, and leads to a few gut churning cliff hangers… and it also leads to, in my mind, the books only real flaw. But I won’t talk about that yet. 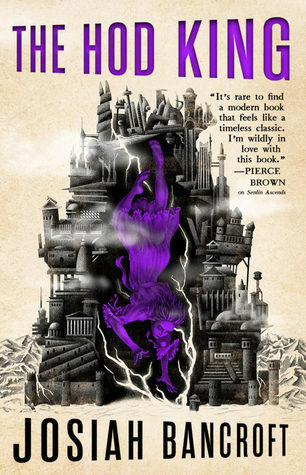 The Books of Babel series has always been, at its heart, a series about Thomas Senlin and his transformation at the hands of the tower and its weight. By this point, Senlin has been through the wringer and has taken on many guises and done what no unassuming headmaster should have been capable of. But he has also changed irrevocably. Gone is the wonder and awe of book 1. Senlin no longer see’s the ringdoms as quaint and spectacular. He sees beneath the surface, and rarely likes what he sees, and the narrative follows that trend. As such, The Hod King has a cynical feel to it, because Senlin has a cynical feel about the tower. It works, and serves to make each of the Books of Babel unique. Despite that cynicism, The Hod King is still packed with joy and wit and humour, and rarely a page goes by without some wonderful line that will have you smiling. So I mentioned a flaw, and there really only was one for me. In part 3, the pacing grinds to a halt for a number of chapters. It’s not that there isn’t anything happening, or there isn’t some VERY important information being thrown our way. It’s just that we go back in time (for the second time), and just after being hit with a giant cliff hanger. It was frustrating and made the book feel like it completely lost its pacing for a good few chapters. And with that flaw dragged out into the open… I’m still giving the book 5 stars because I just bloody well loved it. If book 4 can deliver on half the things book 3 has set up, it will be a cracking finale, and I cannot wait to read it.